Take a Break, Go Fishing. For most of us, whitetail hunting is a yearlong process. My deer season closes at the end of the year and barely a month goes by before I start planning next year’s hunts. Winter scouting leads to shed hunting, transitioning into habitat work on the farm. Timber stand improvement and food plot maintenance. Trail cameras in July. Hanging stands and putting in fall food plots in August. Than hunting September to January. Rinse and Repeat. I know I am not the only one that lives that cycle. Let’s take a step back for a minute though. Its summer. Take a moment to relax. Take a break from your whitetail obsession. My suggestion? Put down your food plot seed spreader, ignore the trail camera for a day and pick up a fly rod to go chase some panfish. 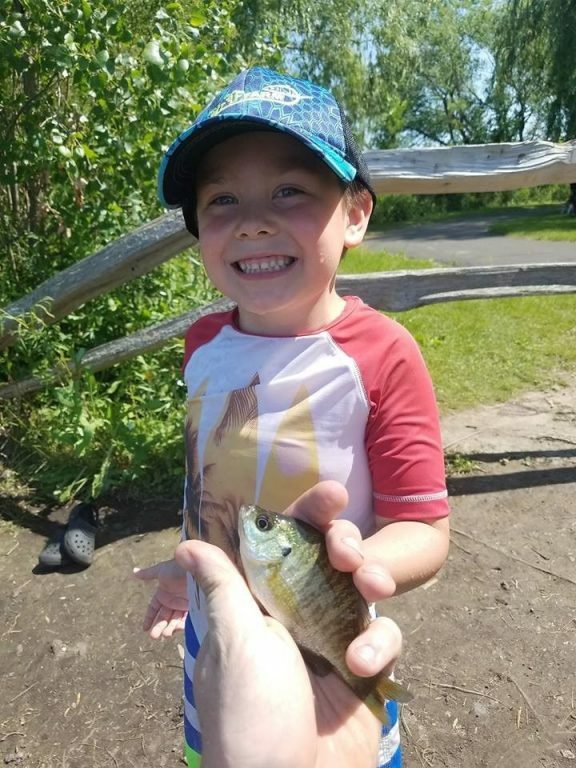 In my home state of Minnesota, “panfish” is a catch-all term for fish in the Centrarchidae family including bluegill, pumpkinseeds and crappies. These are the fish by which most of us got “hooked” on fishing as children; digging up worms and casting red and white bobbers off of lake docks and from family boats. Often, we graduated onto bigger species like walleye, northern pike and lake trout and left the bluegills, sunnies and crappies behind. That’s a shame, because fishing for these welter-weight fighters is fun, regardless of age. Setting aside the spinning tackle and picking up a fly rod to go after some hard hitting panfish will take you back to your childhood faster than a ride in Doc Brown’s DeLorean. Although I am a mediocre fly fisherman at best, I’ve manage to catch most of the Minnesota game fish species on a fly, everything from crappies to Northern pike, and cast for cast nothing is as fun and approachable as panfish. If you have ever thought about trying your hand at fly fishing, hitting your local pond or lake for these little warriors is a great way to get started. The first thing you need to think about is your fly rod. Some guys like to run ultra-light tackle to get the most fight out of the fish, but I like to use a 7-8 foot, 5/6 weight. Its light enough to keep the action exciting, but robust enough for larger species like bass and walleye. Same thing goes for the tippet at the end of your floating line. I shoot for a 5x which preserves the hard hitting action of a small sunfish, but keeps me confident that the line will hold should a larger fish show up. A few weeks back, I hooked a 28-inch northern pike using a small streamer meant for panfish, and managed to get it to shore without the benefit of a leader, the 5x holding strong. Some lifelong spincast fisherman get turned off of fly fishing before they even begin, based solely on the strange-to-them way a fly rod is set up compared to their old tackle. Ready to go fly rod combos that include everything you need to get started are easily available at big box stores. Recently, on the way to a lake I picked up a Martin Complete Fly Combo that included rod, reel, line and a small box of flies. Ready to fish for only $40.00. One thing that can be intimidating when starting to fly fish is the sheer number of types of flies available. With names like Muddler Minnow, Deep Water Damsel, San Juan Worm and Woolly Bugger, it can be a bit confusing figuring out which are appropriate for the fish you are after. Really though, all you need is a handful of a few standards. 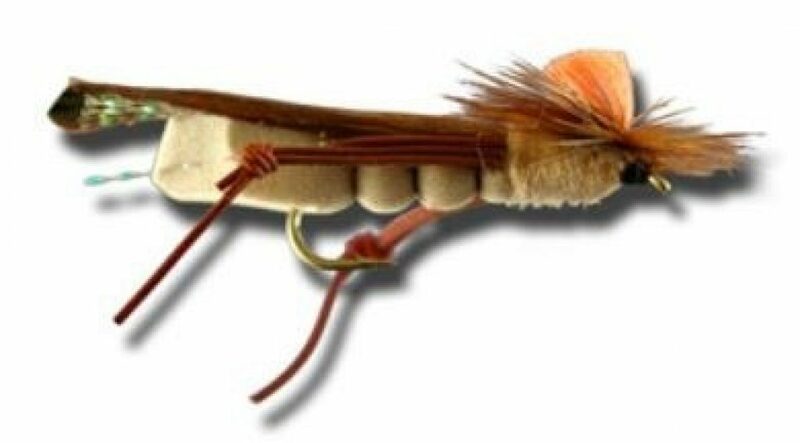 Below are some of my favorite panfish flies. 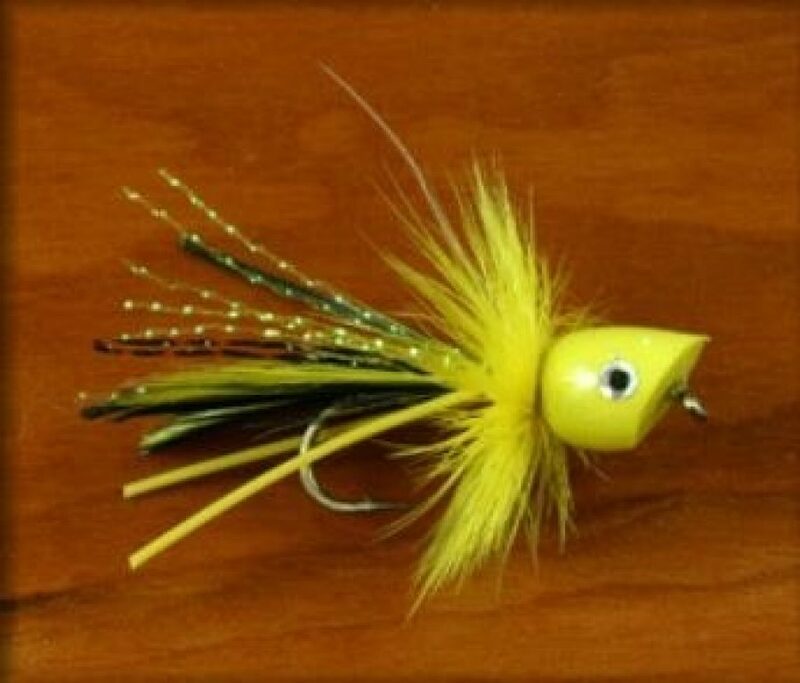 The quintessential panfish fly, the cork popper is a smaller version of larger surface poppers used for bass. It’s definitely my favorite way to go after panfish; hearing that audible “snap” as the little fish takes your fly never gets old. 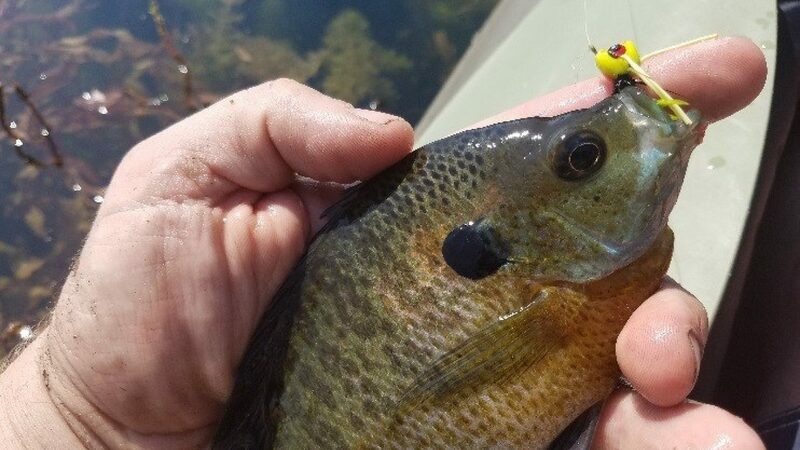 While bass poppers are used to impersonate frogs, these smaller panfish poppers are used as representation of insects on the surface of the water. They are not meant to look like any single species, but the bright colors and movement on the surface encourages the fish to strike. The foam hopper, much like the cork popper is used to fish on the surface. Grasshoppers are a popular pattern but I would also include other terrestrial insects like spiders and ants into this group as well. Amazingly affective in mid to late summer, fish them along the edges of tall grasses. While not as flashy as the poppers, they are more natural looking and can be used to initiate the strike of a crafty old fish that otherwise might ignore a cork popper. 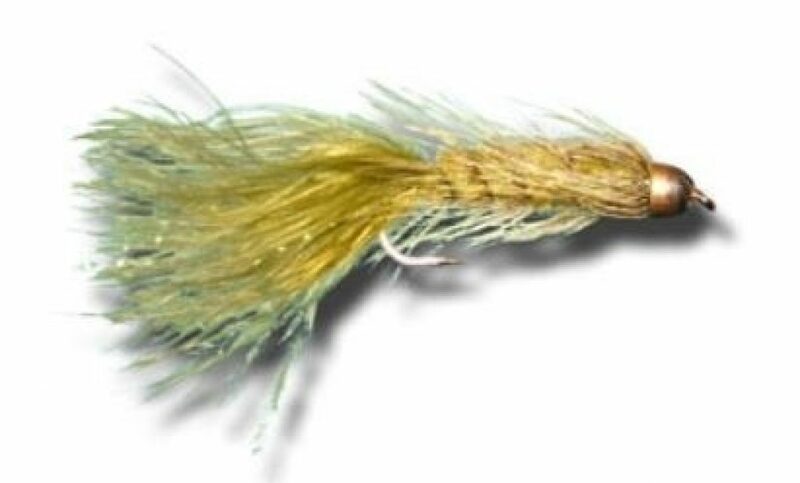 Considered one of the most affective wet flies ever created, a small Wooly Bugger can drive panfish into a frenzy. As a streamer, it is fished under the water’s surface and can be used to imitate a variety of species fish prey on, such as minnows, leaches and worms. I try to always have a couple black and olive colored buggers in my fly box, most often with shiny bead heads to help them sink faster in the water and attract more strikes. 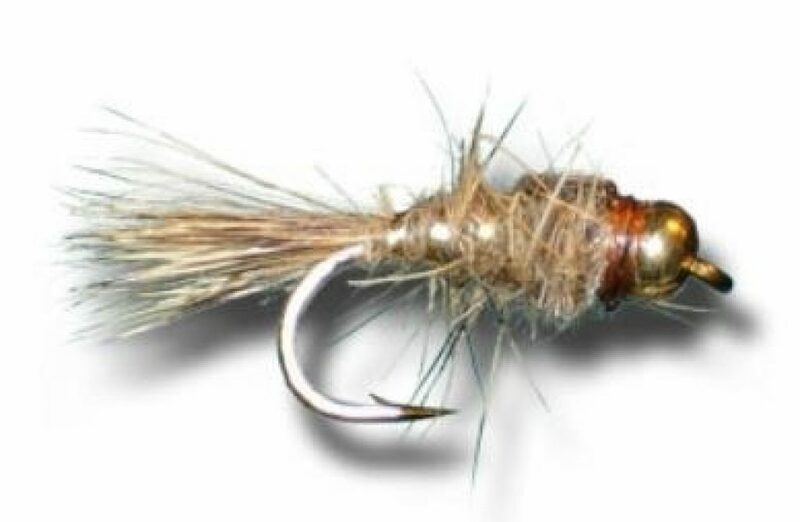 There is no other wet fly more synonymous with fly fishing than the nymph. Nymph patterns are used to imitate the larval stage of insects, and are most effective when used in cold temperature waters where the fish are sitting deep below the surface. While surface flies are meant to entice the fish to come to you, nymphs are all about taking the action to them. Panfish fishing isn’t exactly difficult, nor should it be. It’s supposed to be fun! Here are a few tips though to keep the odds in your favor. If you are sighting fish, but they just aren’t hitting, give your fly a light twitch. Let them know your bug is still “alive”. If fish are striking your fly at almost every cast, it usually means you’ve hit on a school of juveniles. Cast out farther to look for bigger fish, or find that elusive bass that is waiting just outside the small fish zone waiting to ambush. In cold water, present you fly slowly, stripping the line just a few inches at a time. Once the water gets hot, so does the action. Start with the short strips, but follow it up with more aggressive movement. Excited to stop reading, and go fishing? I don’t blame you. Let me leave you with one more piece of advice. Don’t forget how tasty these fish are. Sure, you may need to catch a bucketful to make a meal for you and your family, but it is time well spent, both on the water and in the kitchen. Because the filets are small compared to those of trout, walleye or pike, I like to incorporate panfish into dishes, not serve them on their own as a standalone meal. 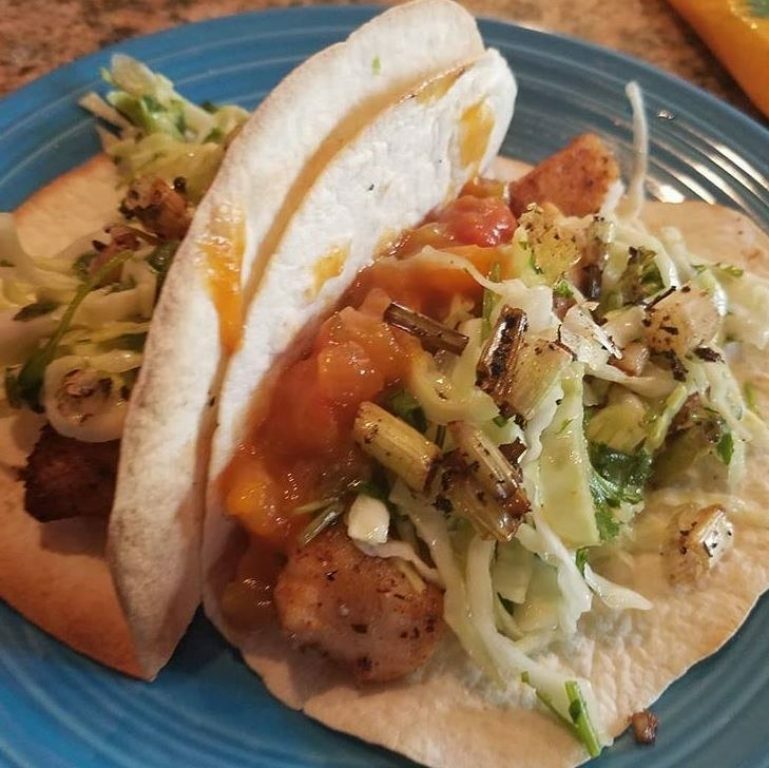 Three words is all it takes to get my kids excited for dinner: fried fish tacos.